Gary’s first business book Crush It! Why Now Is the Time to Cash in on Your Passion hit the New York Times, Wall Street Journal and Associated Press Best-Sellers lists in its first weeks. It maps out Gary’s road rules for how to “Crush It” in today’s business market by following your passion and building your own personal brand. His second New York Times bestseller The Thank You Economy, details the effect of social media on business and has become required reading for business leaders around the world. 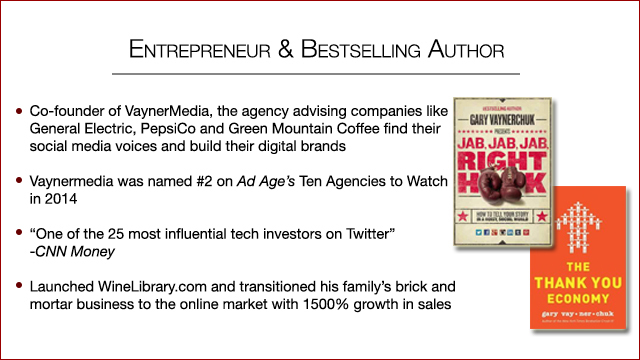 Gary’s most recent book Jab, Jab, Jab, Right Hook: How to Tell Your Story in a Noisy Social World shares how to knock out the competition through the most effective social media strategies. In the spring of 2009, Gary and his brother AJ launched VaynerMedia, a new breed of agency that helps Fortune 500 companies like General Electric and PepsiCo find their social media voices and build their digital brands. 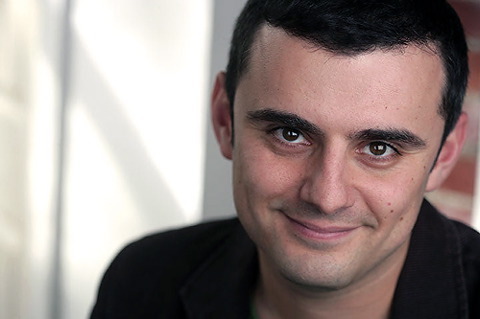 Gary is also the General Partner of a newly formed venture fund, VaynerRSE. Gary has appeared on countless programs from Jimmy Fallon, Late Night with Conan O’Brien and Ellen to MSNBC, CNBC, CNN and NPR. He was also notably featured in Decanter magazine’s 2009 Power List which lists the 50 most influential people in wine. In 2009, Gary was named Innovator of the Year at Wine Enthusiast’s Wine Star Awards as well as one of Askmen.com’s 49 Most Influential Men of 2009. Gary’s ultimate goal is to own the New York Jets. Although his various businesses obviously play an enormous role in his life, he always puts his family first. Gary currently resides in New York City. From figuring out how to effectively communicate on modern platforms - through a picture, through a SnapChat, or through an animated GIF on Tumblr, Gary’s latest insights and information promises to become tomorrow’s standards. In his session, Gary Vaynerchuk teaches entrepreneurs how to take advantage of the current business environment, while also preparing them to succeed as it changes and evolves into what he’s termed “The Thank You Economy.” With the rise of the Internet and the power of the common consumer, businesses must look backwards and scale the caring their grandparents’ businesses exhibited towards their customers, or watch the competition pass them by. Today, individuals and brands that out-care and out-love their competition - those emphasizing quality, value, responsiveness, and attention to detail, among other essentials - see the biggest returns. "Gary was (as completely expected) amazing! What a treat. Thank you for all your help getting that setup. The feedback has been tremendous. "- Director of Sales, Zumasys, Inc.